In 2015, the surprise horror hit of the year was It Follows, a haunting throwback thriller that shocked us all with its quality, gaining it instant acclaim and a quick cult status. 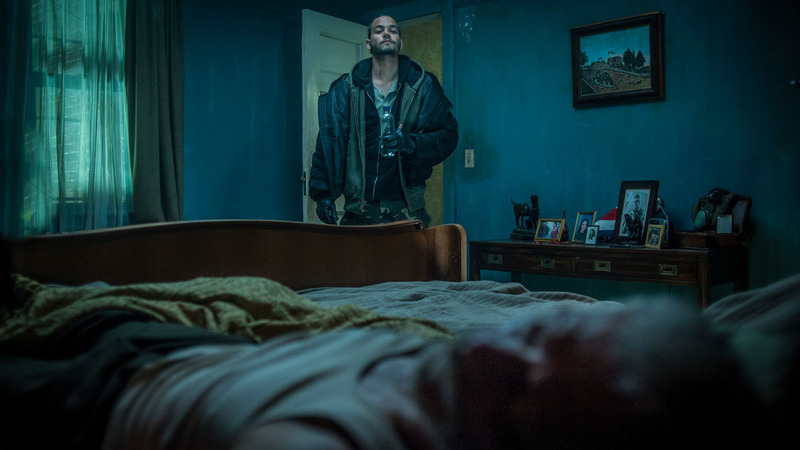 In 2016, the film to take its place was purported to be Don’t Breathe, an equally dark & simple horror flick that steps onto the bodies of its gruesome genre companions in order to reach new heights. And while this film might very well be one of the better & smarter horror blockbusters you’ll see this year, it’s by no means a sparkling gem in the way it was advertised. Don’t Breathe is a claustrophobic nightmare in a good way and a movie that holds itself back from becoming campy, but it’s never special in the way one would hope, finishing as something to politely applaud but not rave about. Three friends, Rocky, Money, & Alex, support themselves in poverty-stricken Detroit by adapting a clever strategy of petty theft. Alex’s dad owns a security company, offering Alex access to keys, codes, intel, etc. So it’s quite simple; find a house with the system, turn it off, steal a small amount of sellable goods, trade them in for cash, make a small profit, never become a big criminal unit, avoid attention & potentially strong charges. It’s a nice plan, but as with all bandit bands, there’s always a reason to break your own rules for one big score, a job that will supposedly be the last. The trio attempt a break in of the house of a blind veteran who is rumored to be hiding loads of cash. The money is there, the guy can’t see; it’ll be easy, right? Wrong, and it quickly becomes deadly, a game of hide-and-seek in the dark where being found means being killed. First off, the It Follows comparisons. Some critics call that film inconsistent, especially in reference to the monster, citing a lack of precision in the plot as a reason to dismiss the movie from elite conversation. To that I would say that critics are confusing horror with sci-fi. It Follows has a lot in common with the huge hit Stranger Things, but while Stranger Things is sci-fi and therefor follows the laws of that genre, It Follows is horror and so is allowed to be a bit less believable, a mite messier. You won’t see me or other fans criticizing that film for being imperfect; there are no rules surrounding the evil chasing the heroes, there is nothing that it “has” to do. Accepting that is the key to enjoying the movie, and enjoy it I did. Don’t Breathe doesn’t stand up when compared to the best of its genre, though it does keep its head above the muck of the vast majority. Not as good as It Follows or 10 Cloverfield Lane, it’s still much better than so many others, and so deserves respect, if not accolades. It’s a simple set up, pulled off well, focused clearly on one house, one mission, one character even, one future that the events of the night will dictate. It’s a little less scary and somewhat more grotesque than I had imagined, but blasts entertainment with every scene, which can hardly be considered a fault. Obviously, director Fede Alvarez loves David Fincher’s work, especially Panic Room, and while there are worse filmmakers to emulate, Alvarez did borrow enough to question his originality and wonder at his independent ability to craft a scene. And that’s my general problem with Don’t Breathe; it doesn’t feel very original, doesn’t stun as much as I had hoped, and won’t stand out as a must-see this year, despite its many positives and positive reviews.